AUSTIN – Governor Greg Abbott today participated in a Fireside Chat at the U.S. Chamber of Commerce Committee of 100 Meeting (CCC100) in Austin. 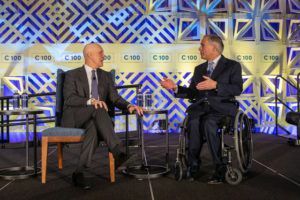 The Governor and CCC100 Chairman Matt Shay discussed the importance of workforce development and the strategies behind Texas’ continued economic success. The Chamber of Commerce Committee of 100 is comprised of chamber executives from across the country that represent the various perspectives of chambers and their members. Twice a year, CCC100 members come together for an exclusive meeting to address issues facing local and regional chambers.